RC Cars Cox 0.49 (Cox Stocker Kyosho f1,beetle) Killer Bee Backplate New Video! Re: RC Cars Cox 0.49 (Cox Stocker Kyosho f1,beetle) Killer Bee Backplate New Video! You doing great on your cox car collection! I have been watching your thread the whole time. The only cox RC car I ever saw live, was the GTP Nissan. Never saw any of those Kyosho ones. I was going to buy a GTP, but got stressed about parts supply, since I actually want to run it. So, hope nobody curses me for this, I got an HPI RS4 3 Evo car. Its 1/10 like the cox, but its modern, 2 speed trans, and has a .18 engine. I won't post pics or more about it here since its off topic, but just wanted to congratulate you on finding those rare cox cars. MeerschaumSteve wrote: You doing great on your cox car collection! I have been watching your thread the whole time. The GTP Nissan is 1/12 scale. This scale has seems to have faded in the last decade while 1/18, 1/10, 1/8 and 1/5 scale have survived. Thanks for the link. The dipstick or Wizzbit looks nice. I won't buy a Zaunkönig, I think it is nothing for beginners like me. At the moment I have not enough time to build a balsa model. But I won't loose it out of sight. The 3 BW's are unlucky in their box in the cellar, they say common guy get us outa here. I allways wanted a plane powered by cox. This was also the motivation to buy a P40 warhawk cl, but as i noticed how valuable they are and of course not easy to fly, I did not try it out. Therefore I stayed on the ground and I bethink of my cox f1 car which is showed here. Hopefully I will become a cox pilot next year. Thank you, it is great that this topic is interesting for you. Feel free to post a picture (and of course anybody can do). 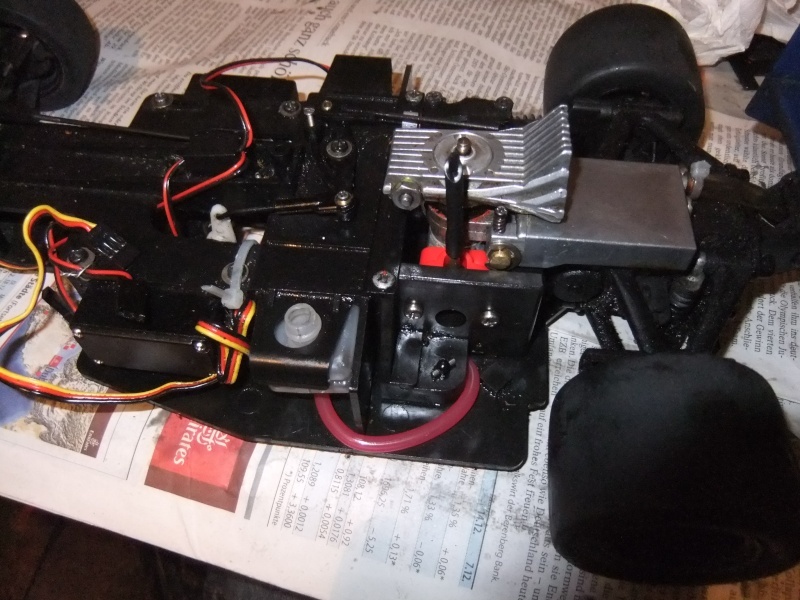 I have also a more modern Kyosho with a small gsx11 engine, but for me it is not the same as the cox. As Jason sayd the cox gtp is 1/12 Scale, but my Kyosho's (beetle 1/10) has a chassis which is as small as the gtp. So it would be possible to fix any 1/12 scale body on this too (depends on wheelbase of course). With the Cox Stocker I will be very carefully. I don't want to crash or crack something. Here in Germany no parts are available and in us they are rare and expensive too. So it will be my sunday car and of course i will doublecheck everything before running. Yes the 1/12 models are sadly fade out in the last years. I think one reason is that they've got only 1/8 and 1/10 in the international championchips. This is a pitty because the 1/12 scale models are looking and driving really nice. Here in Germany the trend goes to 1/5 and 1/6 scale with normal 2 cycle (not nitro) engines or brushless cars. This guy builds them in under 15 minutes. Even a 10 thumbed idiot like me can build, cover and fuel proof in 2 evenings. Thats an argument Maybe I will try it too! Slowly my theory has come true, that the black-horseshoe backplate is only for the waste bin. The one with circlip is even more sh.. than the one with reed retainer. For today I have seen enough. 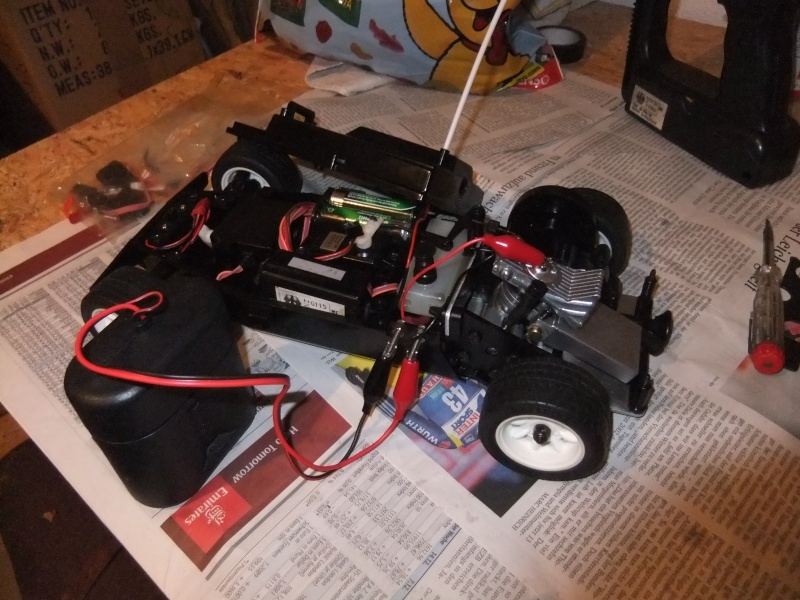 I think it is the reason what everbody says about the Kyosho Cox cars: aah the cox 0.49 Kyosho car that never runs. Maybe it is because of this backplates. brand new engine with throttle muffler, , clutch , heat sink, brake belt, gears, etc... all new. that's a super rare item . should get it for restore your car for display. The 0.49 Beetle was a normal auction some days ago. I watched it too, maybe the seller received a buy it now offer, because the original auction was from 1 $. I have the same one and will try to run it in the next 2 weeks. I will receive the engine spare parts soon. currently only playing with aircraft but may try my hand at adapting slot cars to Cox IC engines. I never intend to try and find the older cars simply for econimic reasons. In my youth I had most all the new offering from Sears, Woolworths, Western Auto, Army Post Exchange, or wherever my folks found them for my birthdays or Christmas....very fond memories. I had a RC version later with electric power 1/10 scale. I think around 1988 I got my son a Team Associated RC 10 kit that tooks us weeks to figure out and assemble. serious sophistication in the modern suspensions and proportional RC gear. Yep, I'm still watching from the shadows too. 3,244 views and 110 posts in this thread. That's a lot of interested lurkers. 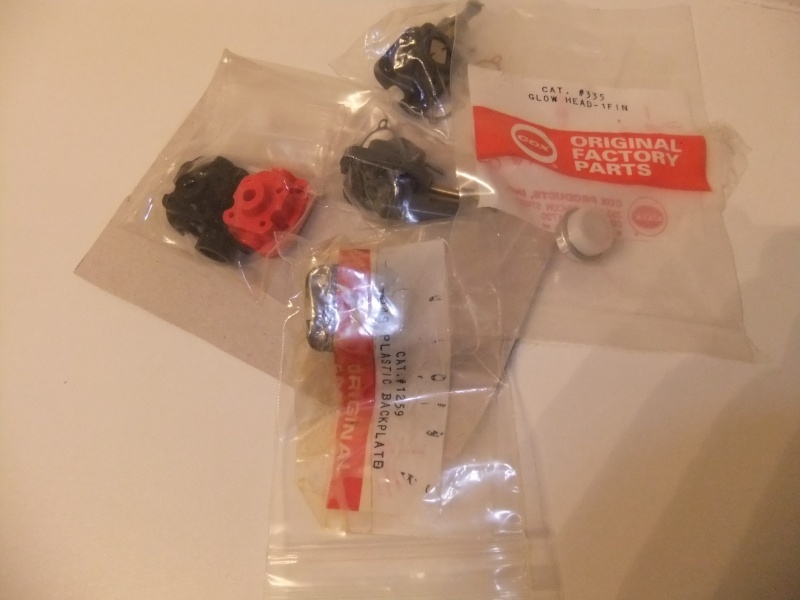 Yesterday I received a bundle of cox parts from cox.eu. Now I can start to repair and refurbish all cars. 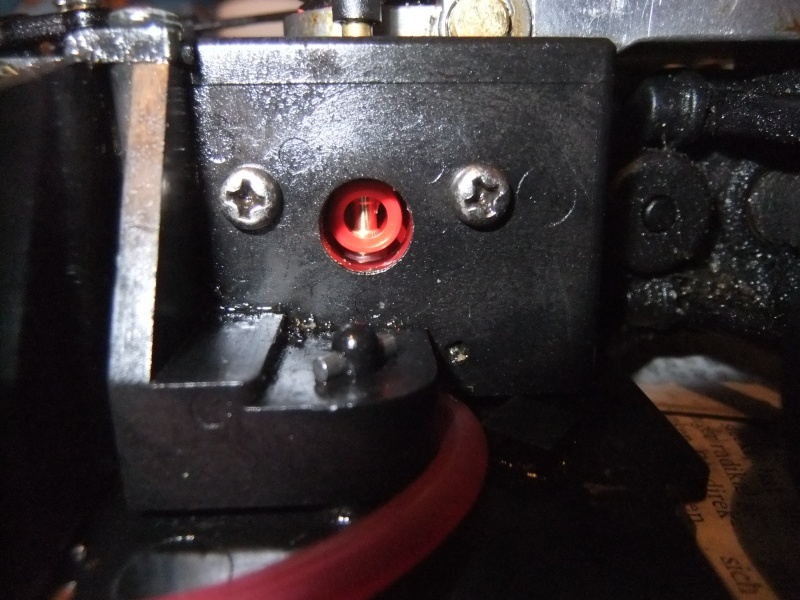 The Espo is still running, but as mentioned with a low perfomance backplate. I think i have enough parts for the next season now. I can't wait to hear the beetle engine run again and I am excited if it delivers the same power/speed like the Espo. The Cox 0.49 beetle is more a rtr car, all plastic parts (except the body and tires) looking cheap. I will make a short video as soon as it is running well. I think I'm a little bit in the same situation as you . I'm a neighbor from Belgium and also have a Kyosho F1 F189 with a 049 COX engine in it. I bought it when I was 15 years old, now 20 years later; I restarted my old hobby and tried to run the car again. Thanks to the web I was able to find all necessary parts (coxinternational and ebay). The most difficult was indeed the fuel but I bought a 25% nitro fuel and added castor oil based on the calculator available in the COX fuel guide. The engine is running fine; my only problem is the clutch. I do not understand (anymore?) the working of the clutch. 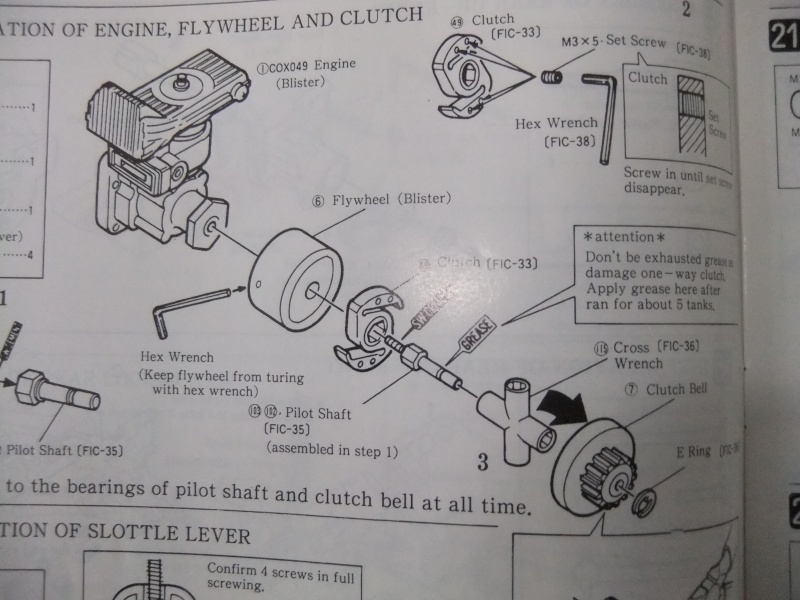 I know that, when the engine is on high rpm, the clutch will open and create fraction on the clutch bell to run the wheels, while on low rpm, the clutch is slipping so the wheels can be blocked. What I do not understand is how the clutch will have grip to start the engine via turning the wheels by hand. I’m not able to start because my clutch is not having grip on that moment. 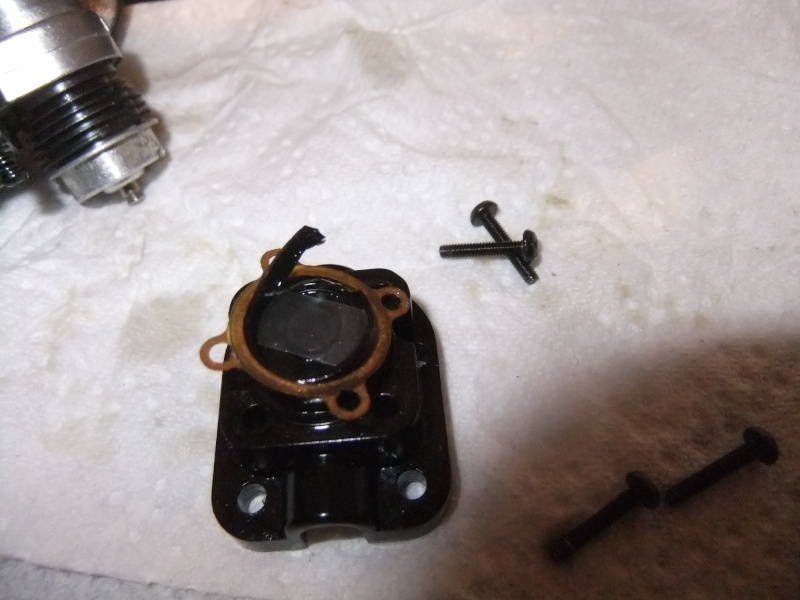 Maybe something important is missing but I checked the manual and I only see the clutch and clutch bell, nothing more to install. Any idea what can be wrong? I would be happy if I could drive this car again. I saw your video’s and I remember how great it was. 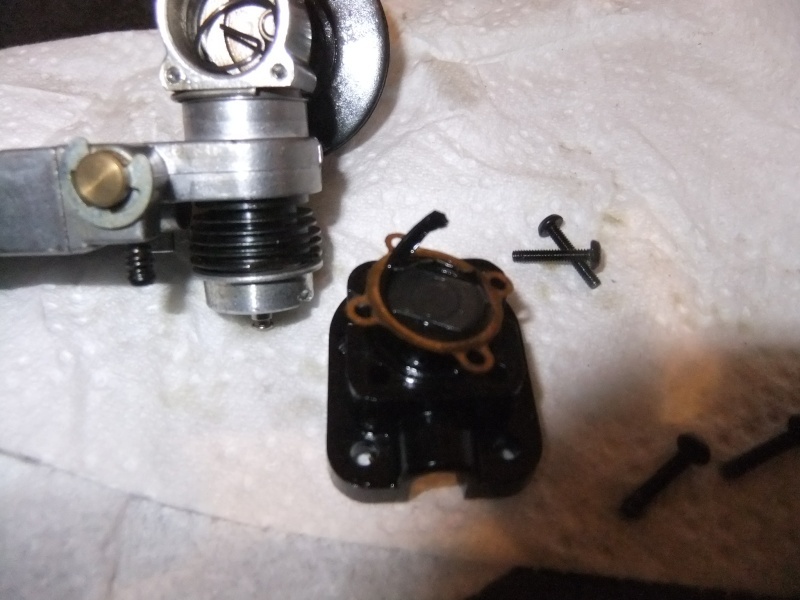 PS: I’m able to start and adjust the engine if I fix the clutch in the clutch bell, but as you can imagine, then I cannot stop the wheels when motor is idle. Hey that's great to heart that there are other people who own a cox f1 car. There is a small bearing in the clutchbell. It is a special bearing which only works in one direction. 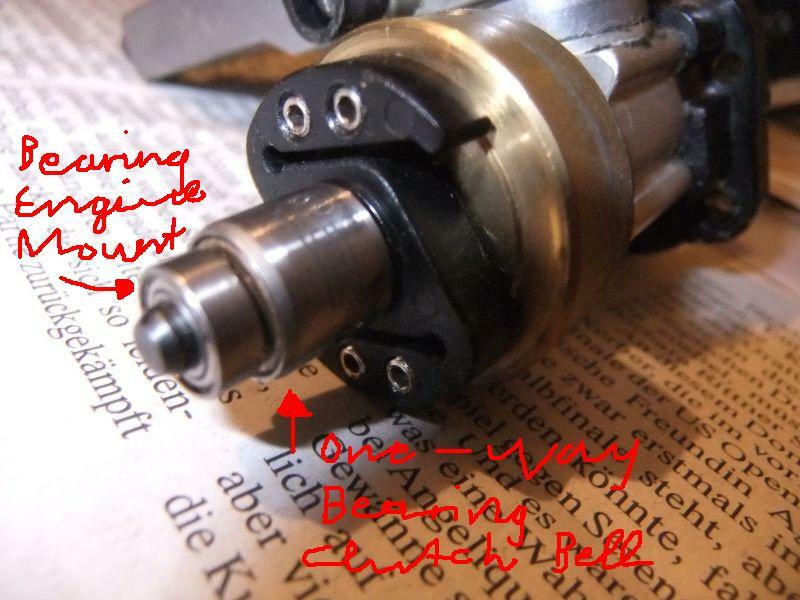 If you twist the wheels for starting, the pilot shaft will be blocked by the bearing and turns round the engine. After starting, the engine runs free in this ,,bearing'' with the flywheel and clutch (the clutch bell and drivetrain don't run). With higher rpm, the clutch will open and run the drivetrain as you described. The wheels are running at low speed all the time at my model (but not on the ground only if I have it in my hand). I think you have to check this bearing again. Maybe there is to much lube on it. I had to clean it before it works (before cleaning it works in both directions), you can check this if you twist the clutch bell, it should only be possible in one direction (with the engine outside the car) . But it is very important to add some grease on the pilot shaft again in order to prevent wear out of the bearing. Thanks a lot for your answer. I checked my clutch bell an there is no "one way bearing" in it, only a plastic bus. I cannot remember where the correct bearing is, maybe it was broken and that could be the reason why I stopped playing with the car 20 years ago (as a child). Do you have a partnumber, sizing, photo of this bearing so I can start searching it. Is it common available in a model shop you think? 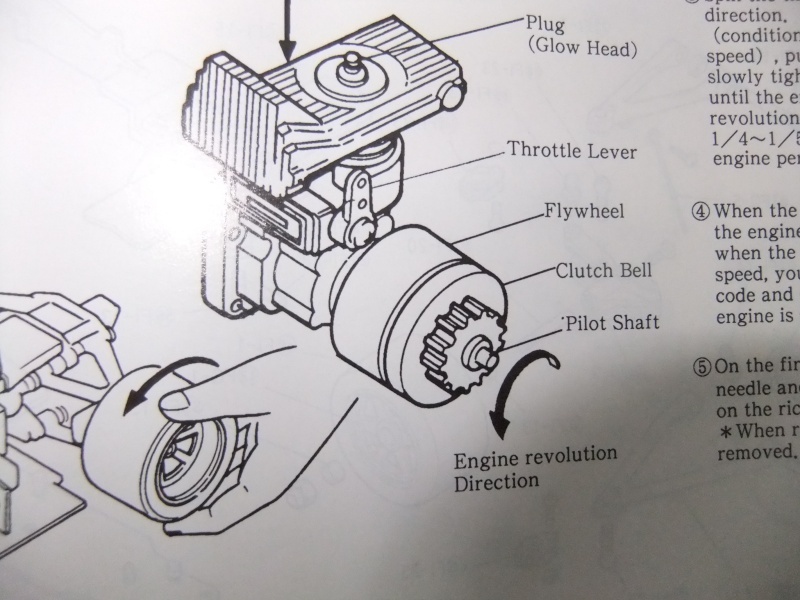 Are the clutch bell and the one way bearing one same part you think? The clutch bell should have partnmber FG-10 but I cannot find it for sale on theweb. I also did not find a clutchbell yet (still looking for one in order to complete my other f1 car). The bearing you showed off is wrong. If I find the time to disassemble the car I will post a picture or number. As you know it is not possible to get the engine outside the car in 5 minutes. Thanks for the pictures you have posted. This gives me a idea what I'm looking for. This afternoon I did 2 model shops but none of them have one way bearings with those meassurements . I also contacted Kyosho Europe (UK) but also they cannot provide me the correct part. If I found one I let you know. Again thanks a lot for your explanation and photo's. 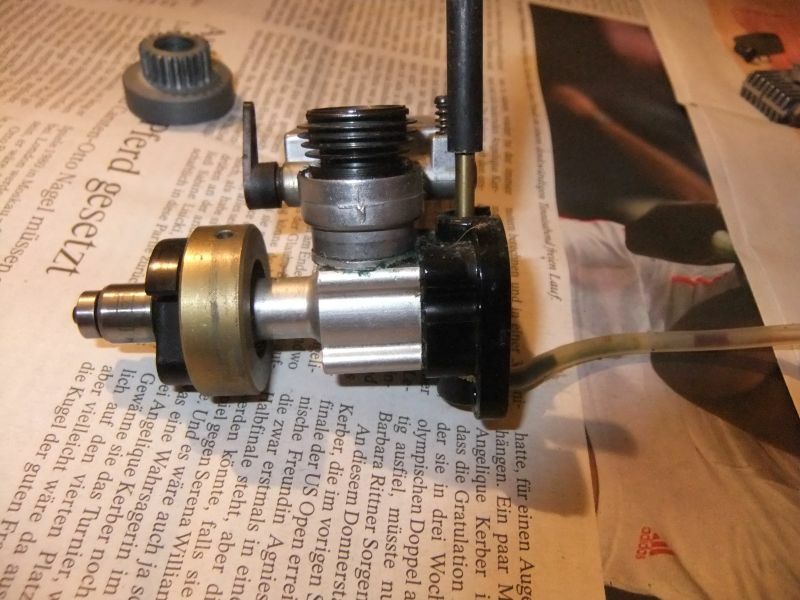 Today I repaired the engine of the cox beetle. 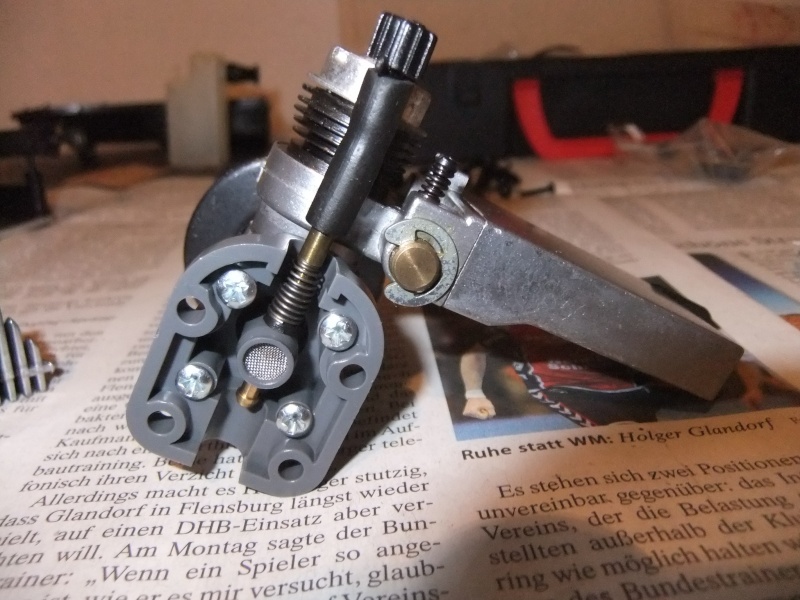 It has the same clutch bell like the Ferarri and Espo but without bearing (only with a plastic bushing because of the spring starter, maybe you have got one of those). 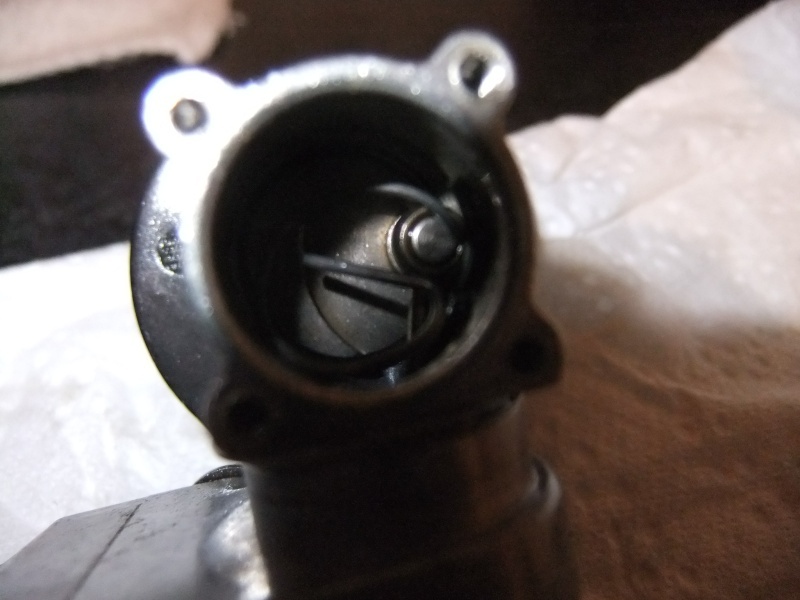 I think you are right, the clutch I have is foreseen with a plastic bushing and is probably wrong delivered. At the moment I'm searching the whole web looking for a one-way-bearing with correct measurement. Yesterday my new parts has arrived from coxinternational (Canada) and I installed all new parts. Now, I'm just waiting for the bearing to be able to drive my car again. 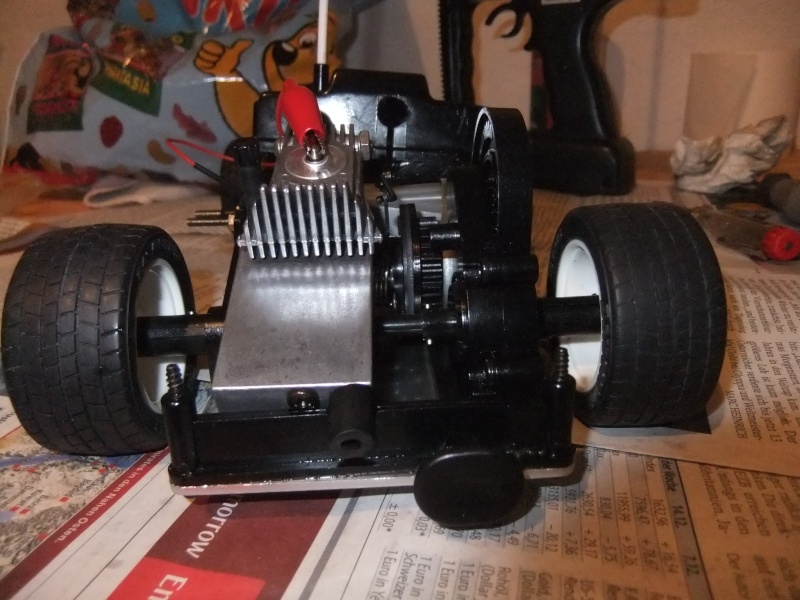 I also bought begin of this week a new ready to run Kyosho Inferno Neo with a KE25 engine. This is a very fast car and nice to drive. Neverthelss my real passion is the COX engine and the car must be able ride again. The new backplate looks great on there coxaddicted! I think if I was going through the trouble to rebuild a rare cox car, I might use allen head bolts to hold things together, just for a bit more style. MeerschaumSteve wrote: The new backplate looks great on there coxaddicted! Why not But bolts are not visible if the engine is built in. In the Kyosho cars are so many different screws/bolts that it would be quite expensive to change them all. Yesterday was marriage between chassis and engine. The beetle is a pré assembled car with many plastic parts. 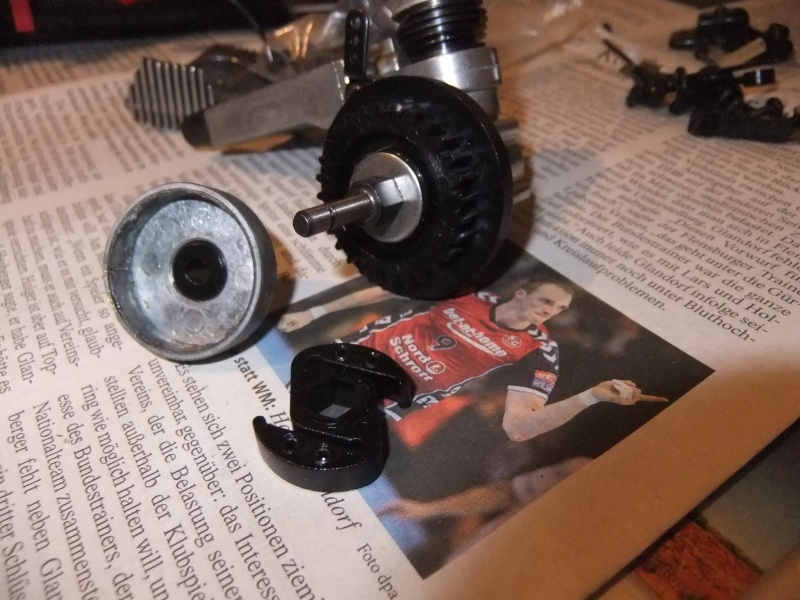 The quality is ok but some parts look cheap, no bearings in the drivetrain (only plástic). Maybe i will start the engine this evening. time for some pictures, first the beetle engine is placed now. 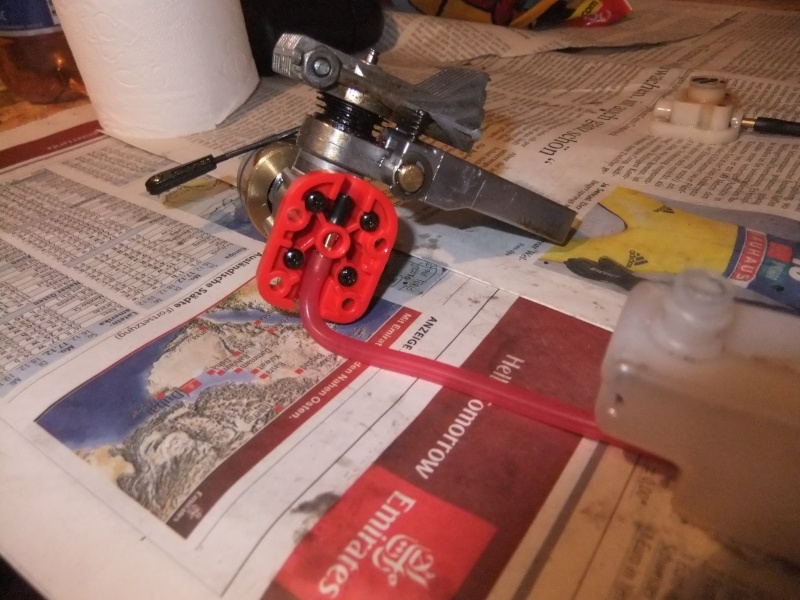 In order to allow an easier starting, the Kyosho engineers built in a ,,onboard'' glow starter. You clamp a battery outside the model. I found also time to place the killer bee backplate in the Espo F1 Car. Here you can see the large venturi. I am thinking to install something like an Air Filter, because the KB Backplate is ,,screenless''.